Ashton, Nigel J, Hellema, Duco. 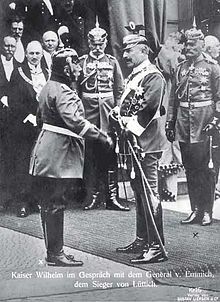 Hanging the Kaiser: Anglo-Dutch Relations and the Fate of Wilhelm II, 1918 – 20. Diplomacy & Statecraft. Т. 11. 2000. DOI:10.1080/09592290008406157. с. 53 – 78. .
Associated Press. The Kaiser's Conference – Trying to Solve the Workingmen's Problem. Formal Organization of the Delegates in Berlin – Seeking a New Government Combination. The New York Times, 15 март 1890. Посетен на 15 февруари 2012. .
Balfour, Michael. The Kaiser and his Times. Houghton Mifflin, 1964. . 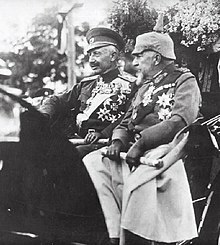 The Kaiser: New Research on Wilhelm II's Role in Imperial Germany. Cambridge University Press, 2003. ISBN 978-0-521-82408-8. , 299 pp. ; 12 scholar essays. Butler, David Allen. THE BURDEN OF GUILT: How Germany Shattered the Last Days of Peace, Summer 1914. Casemate Publishers, 2010. ISBN 9781935149576. Посетен на 15 юли 2012. .
Carter, Miranda. George, Nicholas and Wilhelm: Three Royal Cousins and the Road to World War I. 2010. .
Cecil, Lamar. 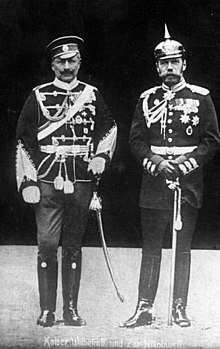 Wilhelm II: Prince and Emperor, 1859 – 1900. Chapel Hill, University of North Carolina Press, 1989. ISBN 0-8078-1828-3. .
Cecil, Lamar. Wilhelm II: Emperor and Exile, 1900 – 1941. 1996. ISBN 0-8078-2283-3. .
Clark, Jr, Robert M. The Evangelical Knights of Saint John. Dallas, TX, 2003. .
Clay, Catrine. King Kaiser Tsar: Three Royal Cousins Who Led the World to War. 2007. , 432 pp. ; popular narrative. Craig, Gordon A. Germany 1866 – 1945. .
F, H. Labor's Cause in Europe – The Kaiser's Conference and the English Strike. Vast Interests the Strike Involves – French Vandalism, Not German, Spoken from Necessity – Tirard's Fall. London, The New York Times, 15 март 1890. Посетен на 15 февруари 2012. .
Fromkin, David. The King and The Cowboy: Theodore Roosevelt and Edward the Seventh, Secret Partners. The Penguin Press, 2008. .
Gauss, Christian. The German Emperor as shown in his public utterances. New York, Scribner, 1915. Посетен на 18 февруари 2012. .
Goetz, Walter. Kaiser Wilhelm II. und die Deutsche Geschichtsschreibung. Historische Zeitschrift. Т. 179. Feb 1955. (на немски) . Hohenzollern, William II. The interview of the Emperor. London Daily Telegraph, 28 октомври 1908. Hohenzollern, William II. My Memoirs: 1878 – 1918. Harper & bros., 1922. , Archive.org. Hull, Isabel V. The Entourage of Kaiser Wilhelm II, 1888 – 1918. 2004. .
König, Wolfgang. The Academy and the Engineering Sciences: an Unwelcome Royal Gift. Minerva: a Review of Science, Learning and Policy. Т. 42. 2004. DOI:10.1007/s11024-004-2111-x. с. 359 – 77. .
Langer, William L и др. Western Civilization. 1968. Ludwig, Emil. Wilhelm Hohenzollern: The Last of the Kaisers. New York, GP Putnam's Sons, 1927. ISBN 0-404-04067-5. .
Macdonogh. The Last Kaiser: William the Impetuous. London, Weidenfeld & Nicolson, 2001. ISBN 978-1-84212-478-9. .
Martin, Gilbert. First World War. 1994. .
Massie, Robert K.. Dreadnought Britain, Germany and the Coming of the Great War. 1991. .
McLean, Roderick R. Kaiser Wilhelm II and the British Royal Family: Anglo-German Dynastic Relations in Political Context, 1890 – 1914. History. Т. 86. 2001. DOI:10.1111/1468-229X.00202. с. 478 – 502. .
New York Times. 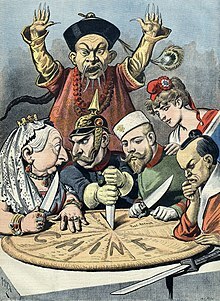 KAISER, 25 YEARS A RULER, HAILED AS CHIEF PEACEMAKER; Men of Mark in and Out of His Dominions Write Exclusively for The New York Times Their High Opinion of His Work in Behalf of Peace and Progress During the Quarter Century That Has Elapsed Since He Became King of Prussia and German Emperor. The New York Times, 8 юни 1913. Посетен на 22 февруари 2012. .
Nipperdey, Thomas. Deutsche Geschichte 1866 – 1918. Т. 2: Machtstaat vor der Demokratie. 1992. (на немски) , translated in Evans, Richard J. Rereading German History: From Unification to Reunification, 1800 – 1996. Routledge, 1997. с. 39. .
Pakula, Hannah. The Empress Frederick. Touchstone, 1995. Palmer, Alan. Bismarck. Charles Scribner's Sons, 1976. .
Palmer, Alan. The Kaiser: Warlord of the Second Reich. Charles Scribner's Sons, 1978. .
Petropoulos, Jonathan. Royals and the Reich. Oxford University Press, 2006. .
Reinermann, Lothar. Fleet Street and the Kaiser: British Public Opinion and Wilhelm II. German History. Т. 26. Oct 2008. DOI:10.1093/gerhis/ghn046. с. 469. .
Kaiser Wilhelm II: New Interpretations − the Corfu Papers. Cambridge, Cambridge University Press, 2005, . .
Röhl, John CG. 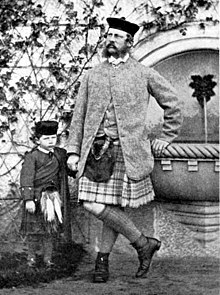 Young Wilhelm: The Kaiser's Early Life, 1859 – 1888. Cambridge University Press, 1998. .
Röhl, John CG. The Kaiser's Personal Monarchy, 1888 – 1900. Cambridge University Press, 2004. ISBN 978-0-521-81920-6. , 1310 pp. Röhl, John CG. 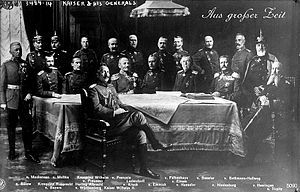 The Kaiser and His Court: Wilhelm II and the Government of Germany. Cambridge University Press, 1994. ISBN 0-521-40223-9. .
Ruggenberg, Robert 'Rob'. How A German Soldier Still Loves His Dead Kaiser. NL, Greatwar, 1998. Посетен на 18 февруари 2012. Schwabe, Klaus. Woodrow Wilson, Revolutionary Germany, and peacemaking, 1918 – 1919. 1985. .
Sainty, Guy Stair. The Orders of Saint John. New York, The American Society of The Most Venerable Order of the Hospital of Saint John in Jerusalem, 1991. Sweetman, John 'Jack'. The Unforgotten Crowns: The German Monarchist Movements, 1918 – 1945. Emory University, 1973. .
Taylor, AJP. Bismarck: The Man and the Statesman. 1967. .
Weinert, Christoph. Wilhelm II. – Die letzten Tage des Deutschen Kaiserreichs. Germany/Belgium, seelmannfilm and German Television, 2007. (на немски) . Wilmott, HP. The First World War. London, Dorling-Kindersley, 2003. .
↑ Books. Google. с. xxiii. Последната промяна на страницата е извършена на 22 април 2019 г. в 14:57 ч.